As men become interested in dressing again after a generation of the worst style—or lack thereof—since men painted on cave walls, classic articles of men's clothing such as pocket squares and suspenders are turning up in conversation around the happy hour table, as well as in our sock drawers. As much as this is so, I offer this question for you to ask yourself: “Why am I wearing suspenders?”, or braces as the British refer to them. Some possible replies may be something like, “ I want to look old fashioned” or “ I'd like to add some spice to my look”. But does anyone answer, “To hold my pants up”? And, if so, why not a belt? Right now I'd venture to say that the majority of braces revivalists are donning such primarily as a fashion statement. Being either poorly or less poorly worn and, I dare say as of yet, rarely dandily executed. The truth of this is revealed when we consider how suspenders came into use. The French probably developed the earliest recognizable precursor in the late 1700s. They wore strips of ribbon fixed into buttonholes called bretelles to hold up their HIGH-WAISTED breeches. Benjamin Franklin developed what he called gallowses, with an “H” shape as part the Philadelphia Volunteer Fire Department's uniform. The next generation, and more recognizable variety with leather buttonholes were developed and sold by Albert Thurston in London in the early 1820s to hold up the high-waisted breeches of HIS day. Mark Twain obtained the first US patent around 1871, and David Roth obtained a patent for his metal clip suspender in 1894. Suspenders were undergarments like corsets or petty coats and were never meant to be seen. They were concealed by the gentleman's waistcoat or vest as they're called today. 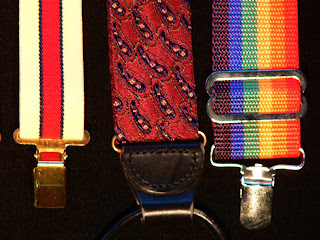 The decline of suspenders and subsequent transition to belts began in the 1890s. 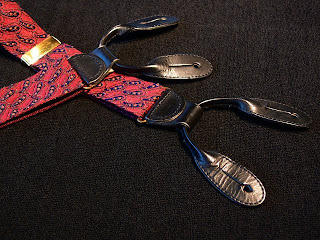 Some of the lore suggests that a very hot summer in 1893 drove men to peel off some layers and opt for belts. If you were slender and had a waist, as most men were and did, this was a viable option. 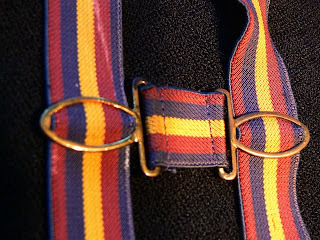 During WWI (1914–18) belts were issued with uniforms. Presumably because they are sturdier and simpler to use. This is also when belt loops on waistbands began showing up with more frequency. The decades after WWI saw increasing simplicity in dress, hence, vests were worn less, requiring belts to be worn more. 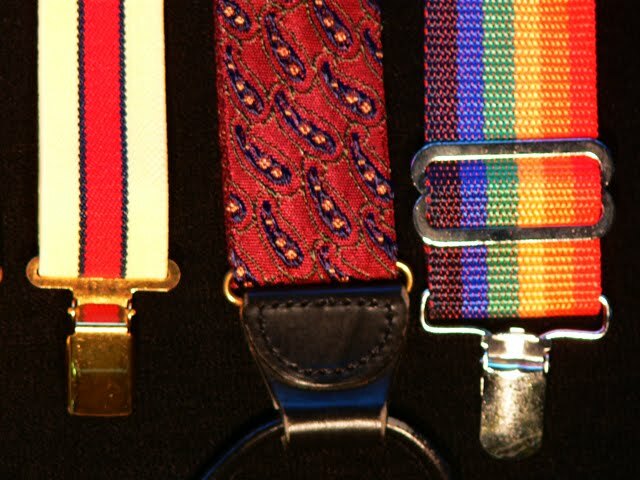 Therefore, the 1930s saw the transition of the suspender buttons from the outside of the waistband to the inside. The return of fuller-cut trousers in the 1940s revived braces, though they never dominated belt use. The point of interest, and what I'd most like to impart to the Dandy Nouveau, is that suspenders and waistlines go hand in hand. Suspenders classically have been worn with trousers hosting a high 'rise' (the measurement from the crotch of the trousers to the top of the waistline). Guys now are trying to wear suspenders with the wrong pants. Unfortunately, most men do not know any better than to wear their trousers very low on the hip. What started as an alternative or counter-cultural statement twenty years ago has become the rule for contemporary aesthetics. In general, this misstep in fashion unnaturally elongates the torso, shortens the legs, and creates a sagging silhouette that cannot be considered elegant. The very nature of suspenders pull the waistband upward. Recently, I was explaining to a customer how a pair of early 60s trousers were cut to be worn around the natural waistline, right around the belly button, and he replied, “I follow my own rules, I wear my pants low”!!! And last week, another customer came by sporting suspenders with not only sagging jeans, but he had them clipped to the top of his front pockets making the torso line even lower to the ground! I wanted to ask him why he was doing that. Did he simply not know better, or was this his Great New Idea? Concerning these two guys, the phenomenon of being brainwashed by our society to believe that our thoughts are original is the subject of another article. For now, the question is, “Will we see men wearing a classic item of clothing in a classic way?” How much ground will we recover? Can we hope to see greater equilibrium presented in our silhouette, or just more sagging made even more ridiculous by plopping suspenders on? My prediction is that we will see both. And, snobbishly put, we can associate higher waistline/shorter drop suspender length with high brow and low waistline/longer drop suspender with low brow. If we can get men's pant waists off the hip, then suspenders do become a 'practical' option to belts and not just a visual statement. 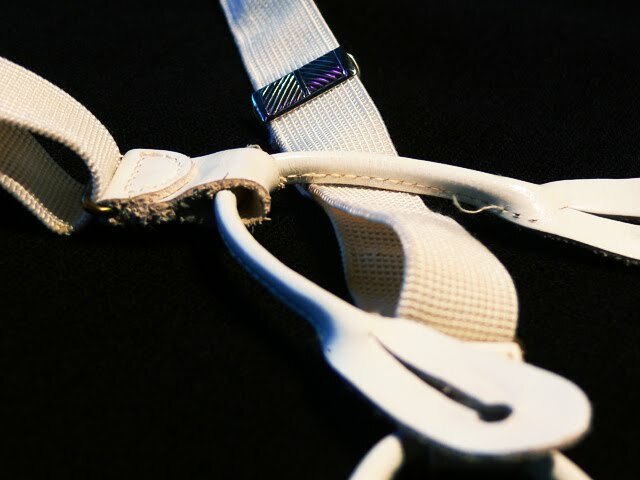 Braces, where trousers are literally suspended or floating around the body, can be more comfortable to wear than belts as belts cinch tightly against the body. Is this still true for us guys with a paunch around the middle? A guy may say, “I can't pull my pants up around my waist. It will make me look fatter.” My answer is, “No, it won't.” If you have a big gut, everyone sees it, and you are better off having an 'Alfred Hitchcock' silhouette than a 'gut hanging over your belt' silhouette. My point being, that if you have a paunch, you NEED suspenders! Throw away your belt and buy some trousers that are a couple of inches larger than you're used to and sleek out that silhouette of yours! Further, a trick I learned from Jay is to wear your suspenders under your shirt if you are dressing casually and don't want to tuck your shirt in. In my opinion, suspenders are ESSENTIAL for a larger gentleman who is ready to clean up his look. Though originally worn only as under garments, these days I see nothing wrong with exposed braces. Thoughtfully worn, corsets and crinolines look wonderful as outer wear though they too were originally never meant to be seen. At one time, seeing a man in his braces was like seeing a lady in her slip and properly worn, a man can seem alluring or intimate in his suspenders. Watch an old 1940s movie and wait until the couple gets back to his apartment where he takes off his suit jacket. You'll see what I mean. Over the years, many widths, colors, and patterns have been made. 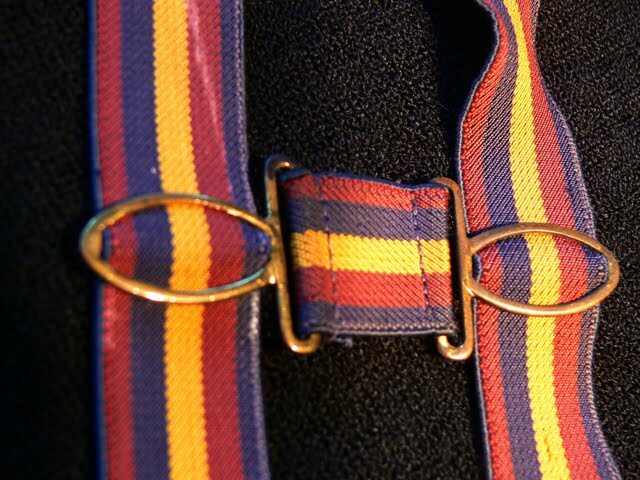 There are many to choose from depending on the look you are after: Slender, 3/4” suspenders are the most old fashioned looking, (50s on back). The 70s, along with wide 'everything else' saw wide suspenders, up to 2”. Currently, there are a lot of 1” styles out there, which are my least favorite, but I will wear, because of the color options. Fortunately, it is getting easier to find a nice 1½” wide option with nice old fashion weave and color patterns. I like wide suspenders for a 'theatrical look', especially if you are on stage, performing, or wearing a costume at a street fair. For colors, white is your classic for black tie occasions, presuming you are wearing a white shirt. (Wear black with a black shirt.) I like maroon for a 40s look, while tan, or gray suits a 30s theme. Mustard and red or mustard and green vertical stripes are great for a 20s stroll down the boardwalk. Black, brocade, or paisley patterns work for a Victorian or Edwardian ensemble, and again black for 50s to early 60s. But these are only ideas and are not hard rules. In closing, there are a couple of house keeping items. A. Button braces are better than clips: Clips can slip off the waistband and will scar the fabric. Button braces are an older style and have an old-fashioned look. It is simple enough to sew buttons on your trousers for suspenders. Any dry cleaner can do it for you. B. Skinhead identities have been associated with suspender use for over 20 years. This is a bit outside my bailiwick, but I believe colors have sometimes delineated social or political positions. C. Watch the Holy Grail of Spaghetti Westerns, Sergio Leone's “Once Upon a Time in the West”. Frank, Henry Fonda's only dark role, SHOT a man for wearing suspenders AND a belt at the same time.